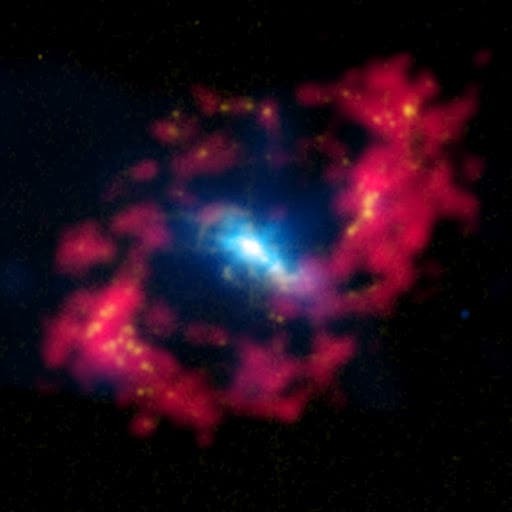 NASA's Wide-field Infrared Survey Explorer (WISE) mission has led to a bonanza of newfound supermassive black holes and extreme galaxies called hot DOGs, or dust-obscured galaxies. Images from the telescope have revealed millions of dusty black hole candidates across the universe and about 1,000 even dustier objects thought to be among the brightest galaxies ever found. These powerful galaxies that burn brightly with infrared light are nicknamed hot DOGs. In two other WISE papers, researchers report finding what are among the brightest galaxies known, one of the main goals of the mission. So far, they have identified about 1,000 candidates. These extreme objects can pour out more than 100 trillion times as much light as our sun. They are so dusty, however, that they appear only in the longest wavelengths of infrared light captured by WISE. NASA's Spitzer Space Telescope followed up on the discoveries in more detail and helped show that, in addition to hosting supermassive black holes feverishly snacking on gas and dust, these DOGs are busy churning out new stars. "We may be seeing a new, rare phase in the evolution of galaxies," said Jingwen Wu of JPL, lead author of the study on the submillimeter observations.